SPEECHLESS. We have not prepared y’all emotionally for what you are about to see. This Southern Maryland engagement was straight out of a movie! The perfect spring temperature, the gorgeous beach sunset, and Taylor knows how to style a session. We’re a little obsessed with this one! Michael just popped the question to Taylor over St. Patrick’s Day weekend and they were itching to get some engagement photos. No time like the present! So we drove over to Prince Frederick last night to meet up with them at their house which SO conveniently had this amazing little beach less than a mile away. They asked if they could bring their little fur baby and y’all already knew what our answer was – of course! It was hard to narrow down a few favorites from last night and you can see why. Congratulations on your engagement Taylor and Michael! We can’t wait to see y’all again soon! 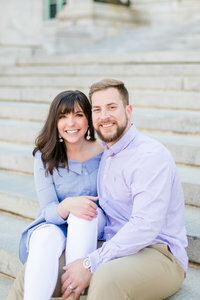 To view more Southern Maryland engagement sessions, browse the links below!